Please come to see me the next time you come to New York, when we won't have a funeral on hand to subdue us. The date of this letter is established by Ferris Greenslet's letter of 20 March 1924 to which Cather was responding. 23 March 1924 was the first Sunday after 20 March. On 20 March 1924, Greenslet sent Cather a carbon of a letter he had just sent to Mary Rice Jewett, responding to a letter she had sent him on 16 March 1924. In her letter, Mary Jewett objected to disparaging remarks by Cather about Sarah Orne Jewett, her works, and her family that had been published in the Boston Transcript. Mary Jewett and Theodore Jewett Eastman (Mary and Sarah's nephew) demanded that Cather be removed from the project of issuing a selected edition of Sarah Jewett's works (see #0718). 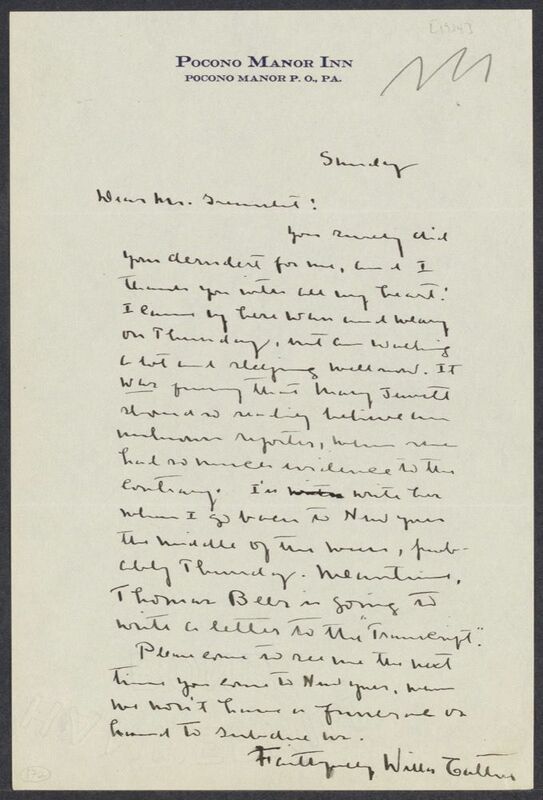 In his 20 March 1924 letter to Mary Rice Jewett, a copy of which he also sent to Theodore Eastman, Greenslet reported his in-person conversation with Cather about the context of the remarks. Several weeks earlier Thomas Beer had invited her to lunch, and she arrived to find Burton Rascoe also there. She explained her plans for the Jewett volumes, and then Rascoe misrepresented them and fabricated additional remarks for his "A Bookman's Day Book" column in the New York Tribune. Edward Edgett, literary editor of the Boston Transcript, then quoted these remarks without giving the source. Greenslet assured Mary Jewett that Cather was "deeply loyal" to her sister's memory and urged her to allow Cather to proceed with the project as planned. Jewett, Mary Rice (1847-1930). Sarah Orne Jewett’s sister. Born in Exeter, NH, to Dr. Theodore Herman Jewett and Caroline Frances Perry Jewett, Mary was the older sister of Sarah Orne Jewett. They both attended Berwick Academy in Berwick, ME, and as adults they continued to live together in the family home in South Berwick, where Mary was active in a local women’s club and charitable work. On Sarah’s death, Mary and Annie Adams Fields became co-executors of Sarah’s literary estate. Cather’s friendship with Mary seems to date primarily from this period after Sarah’s death, and Cather made several visits to Mary at the Jewett family home in Maine. In 1924, with Mary Jewett’s approval, Ferris Greenslet of Houghton Mifflin asked Cather to select and write an introduction to Sarah Jewett’s stories. Shortly thereafter, Burton Rascoe reported critical remarks by Cather about Sarah Jewett’s works and the Jewett family in his “Bookman’s Day Book” column in the New York Tribune. Mary read these remarks as reprinted in the Boston Transcript, was offended, and sought to have Cather removed as editor of her sister’s works. However, Cather and Greenslet persuaded her to reverse this decision (Cather’s letters pleading her case have not been located). Mary Jewett died in South Berwick, and her nephew Theodore Jewett Eastman succeeded to the executorship of Sarah Jewett’s literary estate. Beer, Thomas (1889-1940). American fiction writer, essayist, and biographer. Born in Council Bluffs, IA, Thomas Beer was educated at Yale University and Columbia University Law School. 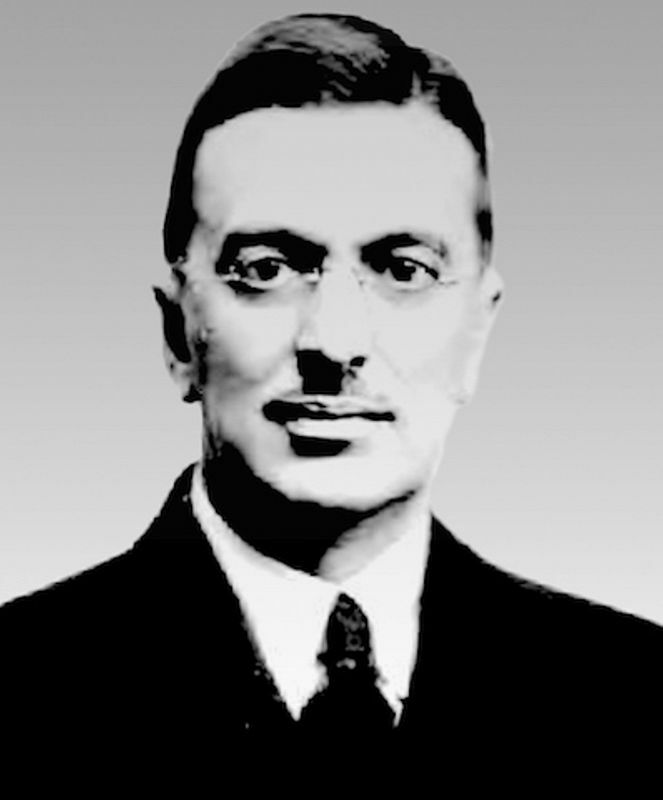 Although he practiced law with his father from 1914 to 1917, he did not return to law practice after serving in World War I. He moved to New York City, living in Greenwich Village and contributing numerous short stories to the Saturday Evening Post. He also published three novels but is best known for The Mauve Decade: American Life at the End of the Nineteenth Century (1926) and biographies Stephen Crane: A Study in American Letters (1923) and Hanna (1929). Cather knew Beer socially and admired his biography of Stephen Crane (in which, scholars later discovered, Beer fabricated sources). Beer died of a heart attack at the Albert Hotel in Greenwich Village.